The 2017 Compass Award competition was dedicated to the poetry of MARIA STEPANOVA. It became Compass seventh and last season. Maria Stepanova is one of the most prominent and politically engaged Russian poets of our time. With more than a dozen poetry volumes to her name, she is also an accomplished journalist and a defender of the freedom of the press. Stepanova is the founder of Colta.ru, an online publication that is often likened to The New York Review of Books. 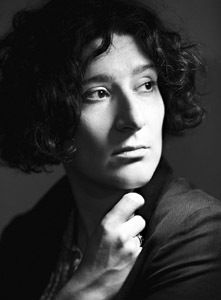 She is the recipient of several Russian and international literary awards. In 2017, Compass Award entered its seventh year, with prior competitions dedicated to Nikolay Gumilev, Marina Tsvetaeva, Maria Petrovykh, Arseny Tarkovsky, Boris Slutsky, and Bella Akhmadulina. It was the first time that we honored a living poet. 1st Place: DMITRI MANIN (California). "Saturday and Sunday burn like stars"
2nd Place: ZACHARY KING (Berlin). "The Women's Locker Room at "Planet Fitness""
3rd Place: JAMIE OLSON (Olympia, Washington). "The Last Songs Are Gathering"
All winning entries were published in the 8th issue of The Cardinal Points Journal . A video recording of the last Compass Award Ceremony and Reading. Compass Translation Award - 2016: Akhmadulina Competition. Compass Translation Award - 2015: Slutsky Competition. Compass Translation Award - 2014: Tarkovsky Competition. Compass Translation Award - 2013: Petrovykh Competition. Compass Translation Award - 2012: Tsvetaeva Competition. Compass Award - 2011: Gumilev Competition.